RSMSSB Supervisor Admit Card 2019 is Available Now: The aspirants whoever applied for the RSMSSB Mahila Paryavekshak Written Test had got a piece of good news. Recently, on 25th February 2019, the Officials of Rajasthan Subordinate and Ministerial Service Selection Board released the RSMSSB Mahila Paryavekshak Hall Ticket 2019 on the Official website @ rsmssb.rajasthan.gov.in. As the Higher Authorities of RSMSSB are ready to conduct the RSMSSB Supervisor Mahila Paryavekshak Exam Date on 3rd March 2019. So, applicants should prepare well for the Written est by referring to the RSMSSB Supervisor Selection Process 2019 from this article. Rajasthan Subordinate and Ministerial Service Selection Board scheduled the RSMSSB Supervisor Mahila Paryavekshak Exam Date 2019 for 3rd March 2019. Make sure that you all note the Exam date and prepare well with good efforts for the Written Test. Since the candidates who got selected in the Written exam are promoted for the further rounds. A candidate is advised to validate all the details on their RSMSSB Supervisor Admit Card 2019. Besides, the Candidates are advised to keep their RSMSSB Mahila Paryavekshak Hall Ticket safe till the joining. Admit Card will be required at the time of joining. Candidates should bring the printout of their RSMSSB Supervisor Hall Ticket 2019 in the examination hall. 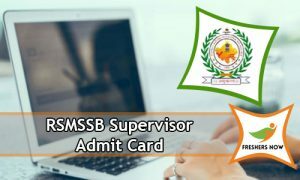 Well, the following steps will help you to download your RSMSSB Supervisor Admit Card 2019. Therefore, please check them and then download the Hall Ticket. Initially, check the official site of the Rajasthan Subordinate and Ministerial Service Selection at www.rsmssb.rajasthan.gov.in. Then go to the Admit Cards section appeared on the Home Screen. Next check for the Download link of RSMSSB Mahila Paryavekshak Hall Ticket and click on it. There enter the required details such as the Registration Number, Date of Birth, Name. Now, Download the RSMSSB Supervisor Mahila Paryavekshak Hall Ticket 2019. Check the details on the Hall Ticket. And you can even take some Copies for safety purpose. Hope you got all the information, you are searching for the RSMSSB Supervisor Admit Card 2019. To get more such Details, always come back to our site freshersnow.com.